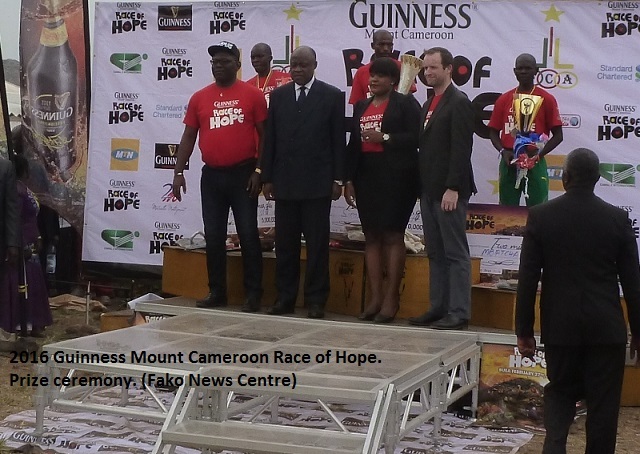 The name of Simplice Ndungeh , an athlete who has come close to winning the Guinness Mount Cameroon Race of Hope several times, has finally entered into the record book of champions. 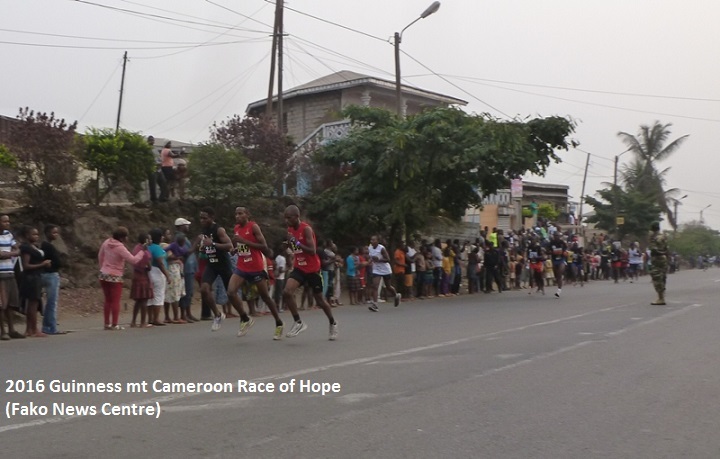 Mr. Ndungeh who hails from the Lebialem Division of the South West Region of Cameroon finished this year’s edition of the race in 4 hours, 30 minutes, 16 seconds while Ngwaya Yvonne, regular female champion from the North West Region of Cameroon, finished the race in 5hours 21 minutes 31 seconds as first female. 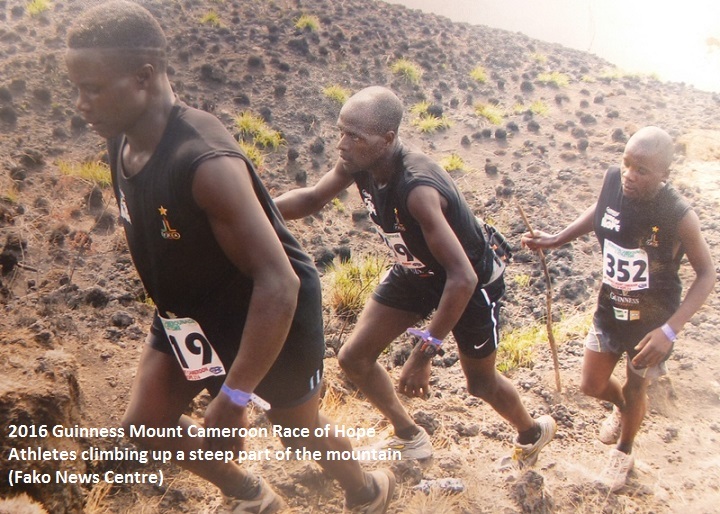 Mr. Ndungeh narrowly lost the race in 2009 to Voffo Momo Ernest after leading the race from the summit only to be overtaken around Bonduma Hill, just about a kilometre to the finish line. He definitely finished the race that year in 3rd position because he was also overtaken by Gabsibuin Godlove a few metres to the finish point. Since then, he has been alternating between 2nd and 5th positions. His winning this year was applauded by many who knew his struggle and most especially because he brought a smile to the South West Region. 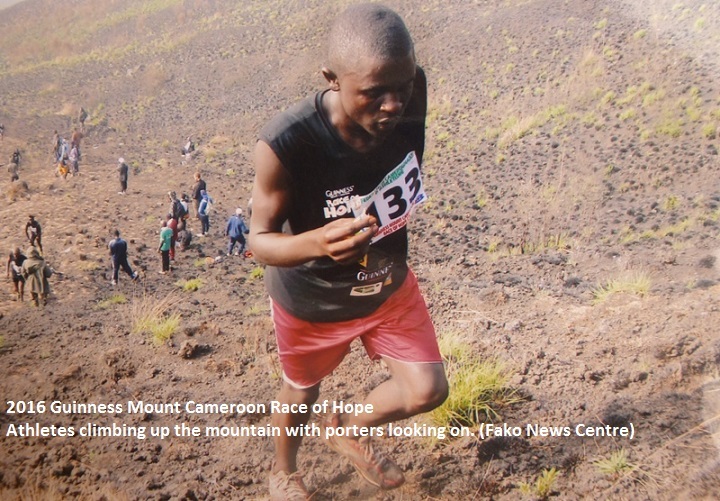 An athlete from the South West Region last won the race in the male category in 1988 when Esuka Reginald Wose won, preventing Lekunze Leku Timothy from winning the third conservative time and from being crowned the King of the Mountain. 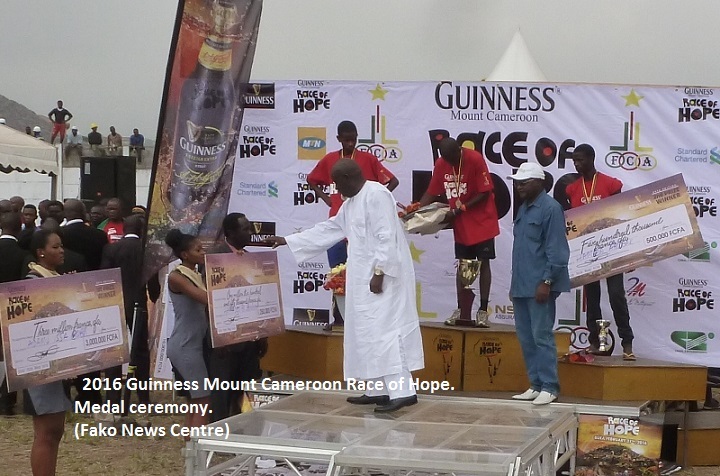 The 2012, 2013 and 2015 champion, Gabsibiun Godlove, came in second position in 4 hours, 30 minutes and 30 seconds while the 2010 and 2014 winner, Mbatcha Eric, finished in 3rd position in 4 hours, 35 minutes and 18 seconds. 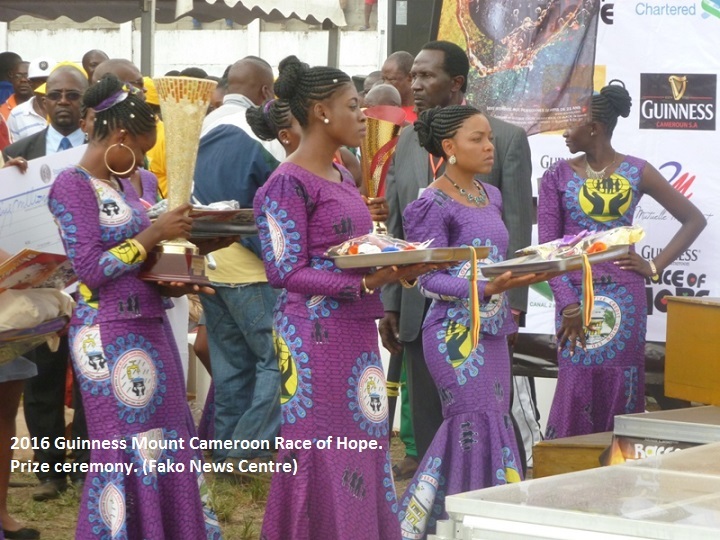 There was lot of effervescence in the female category of the race. Though it was all a family affair, the female champion, Yvonne Ngwaya, did not have it easy from her elder sister, Patience Ngwaya. 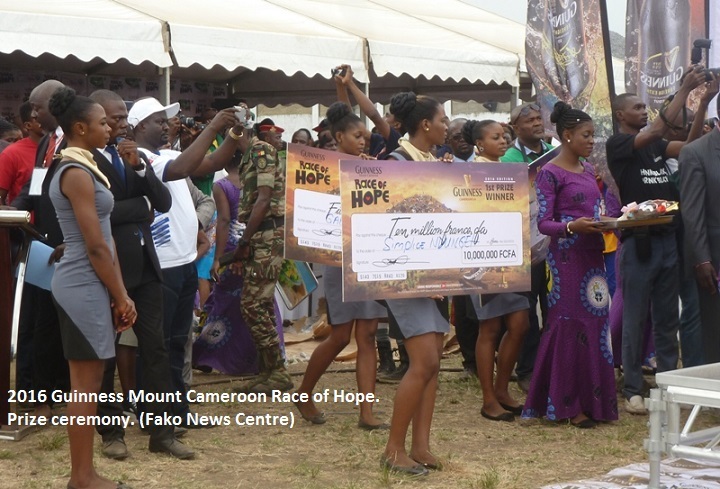 Patience gave her junior sister a run for her money by closely following her in a distance of a few metres from the time they emerged from the forest through Upper Farms to the Buea Central Police Round-about. Despite the applause she got from the crowd motivating her to beat her junior sister, she gradually lost strength as she descended through Bongo Square to Bonduma. She eventually finished the race in 2nd place about 2 minutes behind her junior sister. 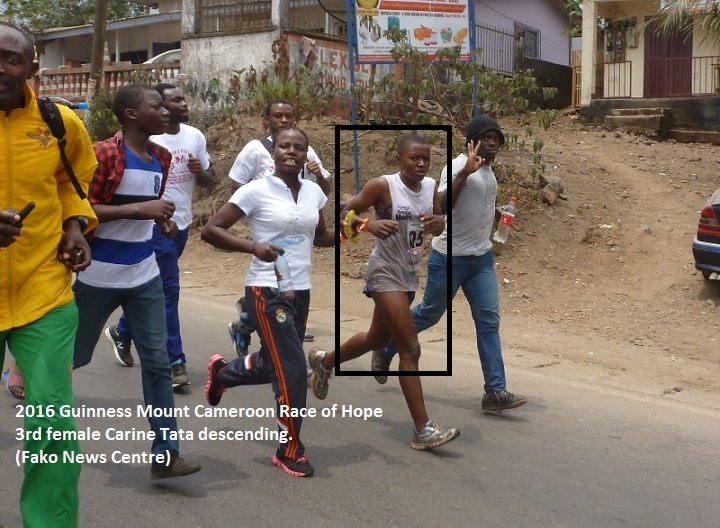 The 3rd position was occupied by Tata Carine, daughter of famous Mount Cameroon Race three times winner (1992, 1996 and 1998), Tatah Thomas. We do not yet know the prize money for the other positions. 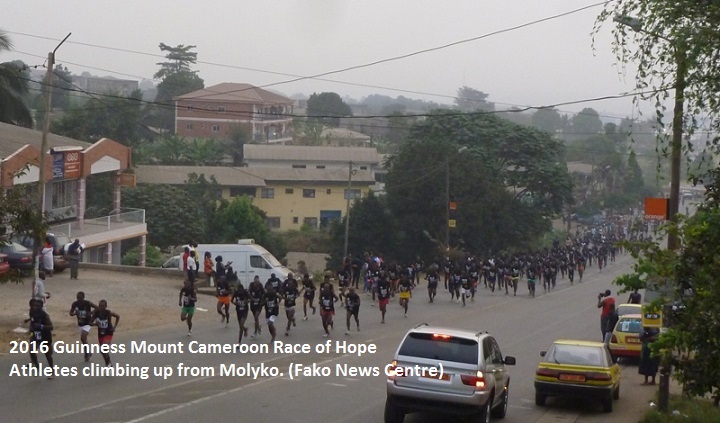 The Buea population was saddened when they learned one of theirs, Lyonga Esombe who was leading the race from the Molyko Stadium to Hut I, was in the relay category. Many thought he was in the individual senior category of the race and like last year where he finished in 3rd position, they were already dreaming of having a champion this year. 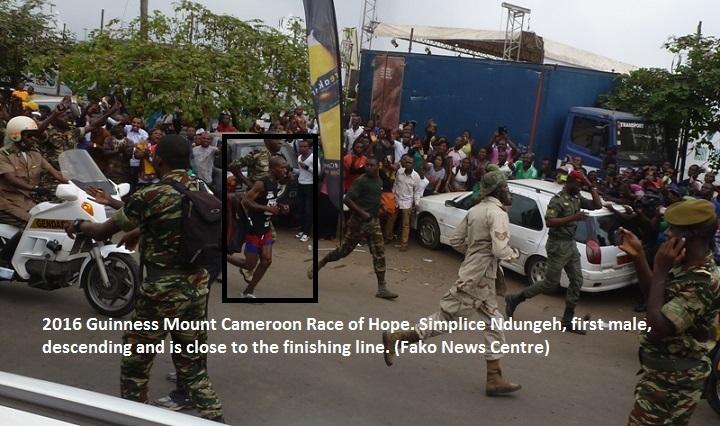 Many wept when they got radio report that he had stopped at Hut One for another member of his team to continue to the next relay point in the race. 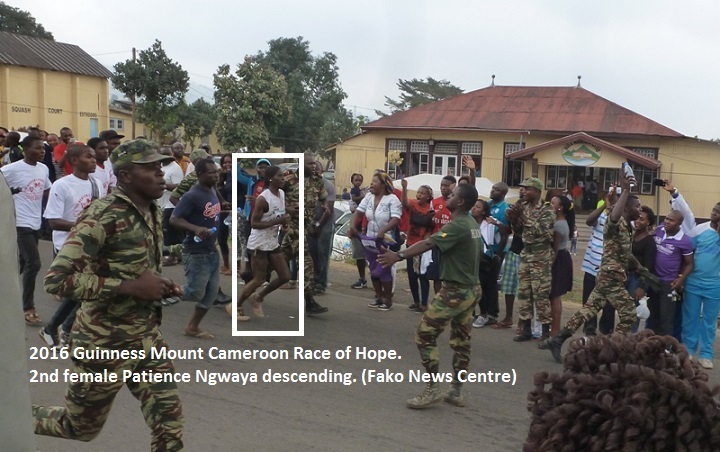 Lyonga Esombe is a soldier and the son of crowned Queen of The Mount Cameroon Race, Sarah Liengu Etonge. His relay team finished in second position. 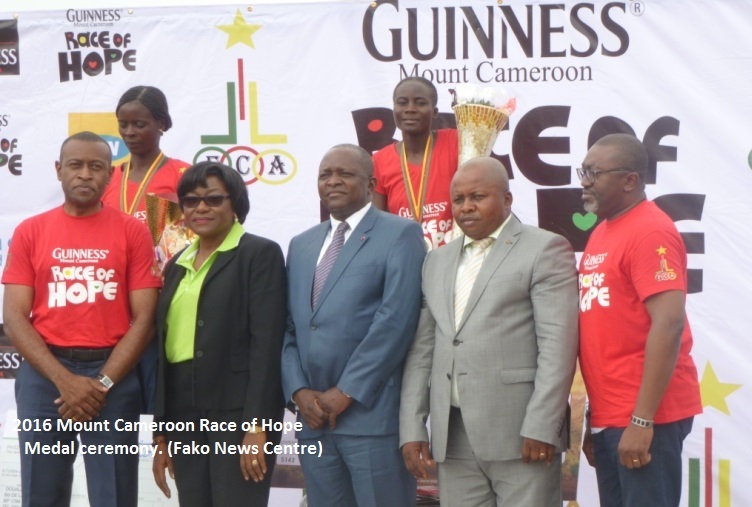 On why he did not participate in the senior full race, Mola Esombe explained that he sustained an injury in his ankle two weeks to the race while finalising preparations for the race. 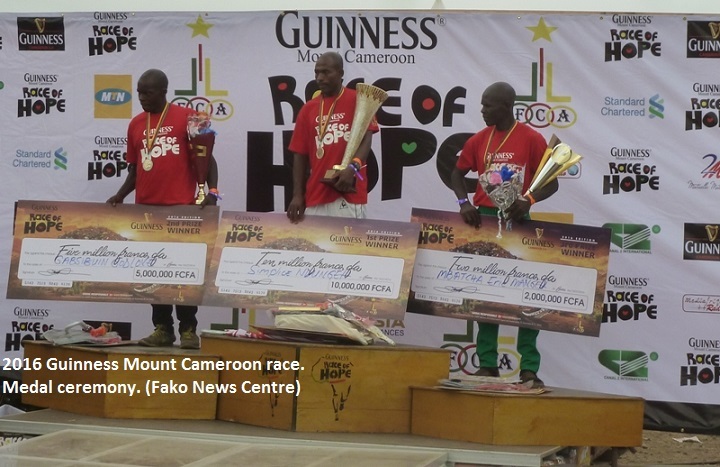 He told Fako News Centre that his doctor advised him not to participate in the full race since he would have strained the injury more while descending the steep slopes of the Hut 2 hill. 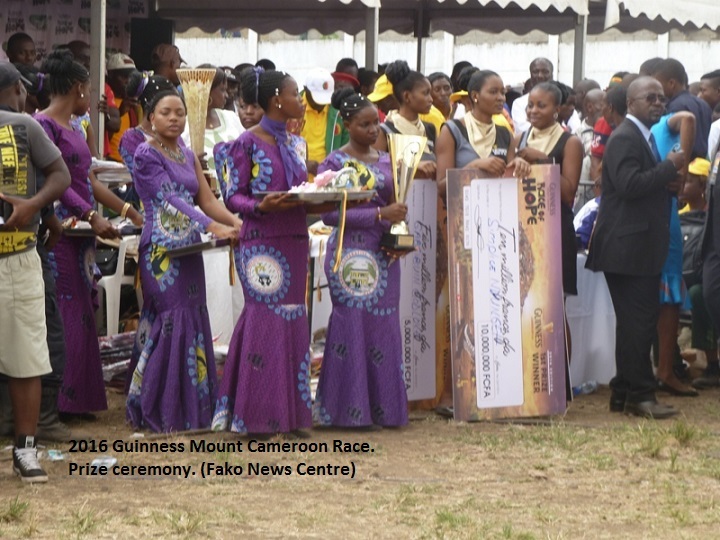 It should be noted that the traditional Miss Mount Cameroon contest was not organised in this edition, something that disappointed thousands of people. The esplanade of the Molyko Stadium was used as the start and finish point due to construction work going in the stadium. 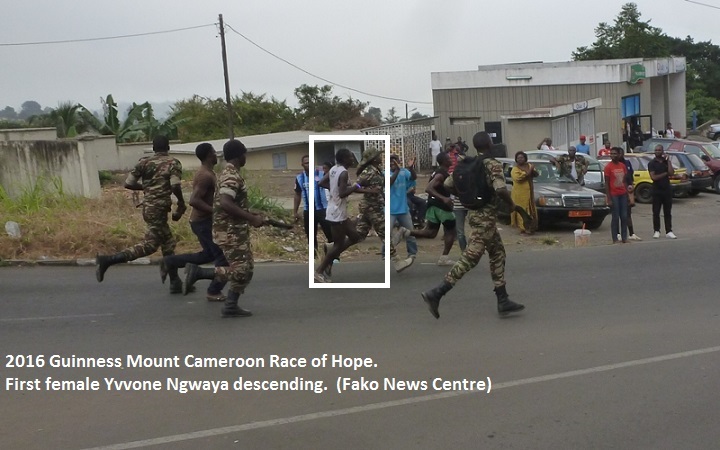 The pictures below are in chronological order from when the race started.